A great straightforward device that allows complex routing combos to be achieved simply and quickly. Makes complex patches available at the touch of a button. Helps solve level issues between +4dBu and -10dBu devices. With built-in MIDI, it's at home on stage and in the studio. Not a lot to speak of. As straightforward in use as it is straightforward looking. Pull-down menus make it incredibly easy to select sources feeding each of the 16 inputs. As useful in a live environment as it is in a studio. The X-Patch is a very straightforward 16-by-16 analogue routing matrix, with enough little extra features to satisfy most needs straight out of the box. Outwardly it's deceptively simple. The front panel sports a power switch, inputs for channels 1 and 2 (either jack or XLR) and outputs for channels 1 and 2 on XLR. The rear panel has four 25-way D-Subs handling the 16 channels of audio ins and outs, an Ethernet socket to connect to your computer, two MIDI ports - one in and one out - and a five-pin DIN socket for the external power supply. Having got it all connected, the next thing to do is to install the supplied software onto your computer and get the two talking, which can be in done one of two ways. If you only have one unit and aren't on a network, a straight Ethernet cable between the two will suffice. If you're on a network or want multiple units connected, you will need an Ethernet hub. Either way works, and both are pretty straightforward to set up using the clear instructions in the online manual. Next, you need to setup your input and output sources. Opening the Setup menu, you can select channels and simply write in the names of all devices you have connected. For each separate in and out, you can set a nominal level of either +4dBu or -10dBu, meaning that you can mix and match pedals and domestic level devices with professional line level devices. This is very handy if you want to use pedals as part of your input chain, or just have a pedal on an insert point, without having to worry about gain compatibility. There are three buttons in the centre: 'Unlink', meaning that the input and output are unrelated; 'Device', denoting a unit through which the signal would pass (such as EQ, compressor or delay); and 'Insert', denoting an insert point. The main Edit page allows you to route devices directly to one another either individually or via chains of up to six devices, which you can store and name individually. In the centre of the Edit page, you have 16 inputs with pull-down menus from which to select the source that feeds them. As you connect devices together, their outputs are greyed-out on the menu to tell you that they are already in use or are part of a chain that's in use. We set up a mix of pedal board, EQs, compressors and DAW ins and outs for our test. At the bottom of the screen is the Chain Editor. You select a chain to edit in the left-hand column, pull in up to six devices, save it and give it a name. You can then save this as a preset (in the right-hand menu) and name it. As you build up a list of chains and presets, you can have complex setups available at the touch of a button. Once you have your presets programmed, you can switch between them using a simple MIDI patch switcher, making it really useful live. This, coupled with the fact that it accepts -10dBu, makes it a very competitive alternative to an expensive custom pedalboard - the flexibility of its patching options, puts it way beyond many we have seen. SSL have certainly thought this one through. Sonically, like all of their SuperAnalogue devices, it is excellent. The simple design and excellent user interface make it really easy to get to grips with, and the flexibility it offers in setting up complex patches can save huge amounts of creative time. 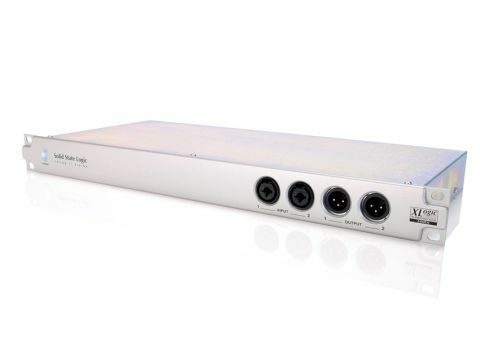 If you don't already have a patchbay, you may find you never need one; if you already have one, you will find yourself using it a hell of a lot less. We can't wait!